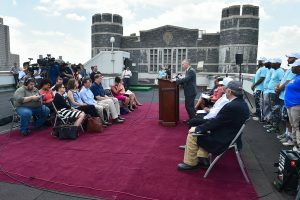 Cool Neighborhoods NYC, a $106 million initiative to mitigate the threat to public health from extreme heat, officially kicked off on June 14 at the Rose Hill campus. The gathering, held on the roof of O’Hare Hall, brought together representatives from government, the private sector, and nonprofit organizations on what was, coincidentally, the first day following a three-day heat wave in the city. Daniel Zarrilli, chief resilience officer and senior director of climate policy and programs for the City of New York, said that 2016 marked the third straight year of record heat in the United States, a consequence of global warming. In New York, one of the consequences of that will be a tripling of the number of 90-degree days between now and 2050. As such, the city is committed to an 80 percent reduction in greenhouse gas emissions by then. “It’s not just heat, though. There are impacts from sea-level rising, increases in storm surges, increases in rain. 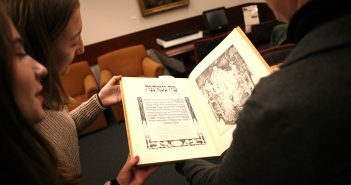 All of this will impact New York City, and we need to be prepared for that,” he said. 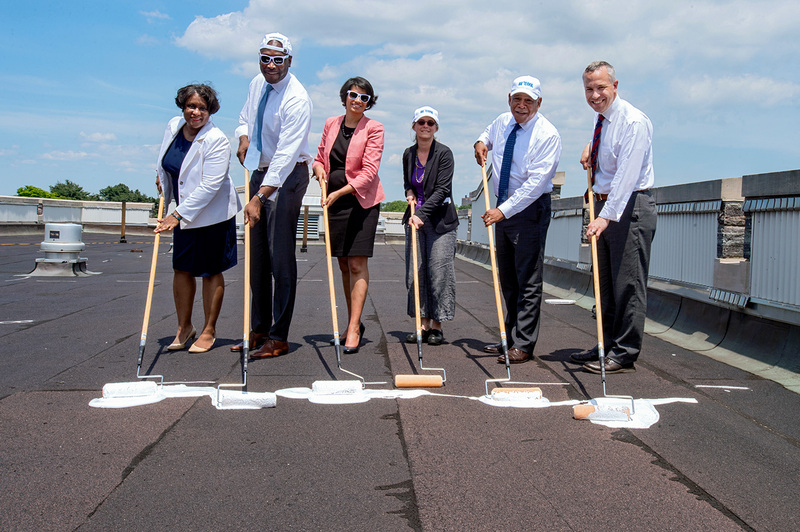 Lesley A. Massiah-Arthur, left, and representatives from the City of New York apply the first coat of white paint to the roof of O’Hare Hall. The Cool Neighborhoods initiative includes plans to plant more trees in the South Bronx, Upper Manhattan, and Central Brooklyn. More outreach efforts to caregivers of the elderly— particularly in neighborhoods with less air conditioning— are also planned. Over the summer months, Fordham will participate in an initiative to make six buildings—O’Hare Hall, Tierney Hall, Martyrs’ Court, McGinley Center, Queens Court, and Walsh Hall— part of the city-wide °CoolRoofs program. At Rose Hill, approximately 82,000 square feet of roof surface will be treated with a specialized coating material that is lightly colored and has high solar reflectivity and high infrared emissivity. A cool roof reduces the amount of energy absorbed by the roof, which helps lower a building’s temperature and cuts energy costs. The program, a partnership between the New York City Department of Small Business Services, the Mayor’s Office of Sustainability, the Mayor’s Office of Recovery and Resiliency, and Sustainable South Bronx, was launched in 2009. 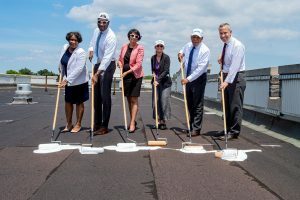 It has coated more than 6.7 million square feet of rooftop across all five boroughs, contributing to lower cooling costs and reducing an estimated 2,680 metric tons of carbon dioxide equivalent (CO2) emissions in the city. The installations are provided by the city at no-cost to non-profit organizations. Jennifer Mitchell, executive director of Sustainable South Bronx, said °CoolRoofs, which currently employs 70 people, has been wildly successful because it pairs environmental work with job training. O’Hare Hall, where the ceremony was held, is one of six buildings on the Rose Hill campus that will be included in the city’s CoolRoofs program. “We are now able to run a program that is helping the environment while at the same time putting people back to work, putting money in their pockets, allowing them to provide for their families, and allowing them to be productive, contributing members of society,” she said. Lesley A. Massiah-Arthur, Fordham’s associate vice president for Government Relations and Urban Affairs, said that 10 years ago, Fordham joined the NYC Carbon Challenge and pledged to reduce its building-based emissions by 30 percent or more over the course of 10 years. While the University has made great strides in the area, there is much more work to be done, she said. “With all the ills of the world that call for repair and redress, combatting climate change may well be the great work of our time. 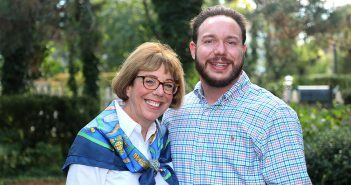 It is, as [Fordham President] Father McShane would say, holy work, taken up on behalf of other people separated from us by time and distance—people who we’ll never know, but whose very lives depend on actions we take today, here and now,” she said. In light of the recent announcement by President Trump that the United States will withdraw from the Paris Climate Accord, Massiah-Arthur said Fordham’s participation in the °CoolRoofs program is meant to both reduce the University’s greenhouse gas emissions and signal to others to resist apathy and despair. “By our example, we show that people of good conscious and good will can affect the necessary changes before it is too late,” she said.